TSE 448: Why Your Account-Based Sales Strategy Is Failing And How Data-Driven Sales Can Help. 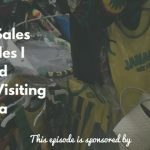 Home » TSE Podcast Post Page » TSE 448: Why Your Account-Based Sales Strategy Is Failing And How Data-Driven Sales Can Help. So I’m bringing in Vicki Godfrey on the show today. She is the Chief Marketing Officer at Avention, a B2B data company that helps sales and marketing professionals with company and contact information so they can be successful in growing their businesses. 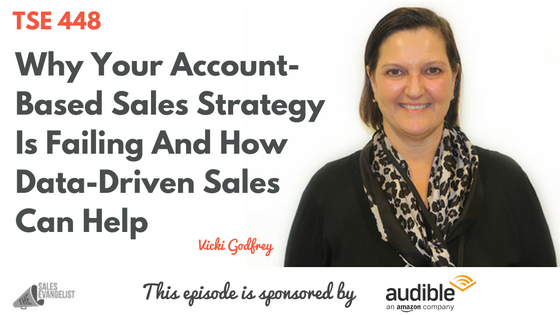 Today, Victoria shares about what you can do to help your sales and marketing people come into alignment so you can turn your account-based marketing and sales machine up and running. ABMS or Account-Based Marketing and Sales is a process in which marketing and sales target key accounts. This means selecting and prioritizing accounts to go after, working with marketing and sales in an integrated fashion to target those accounts, coming up with messages delivered at the right time, aligning sales and marketing in the way they go after their accounts, and using data in every step of the way, which is a critical element of success. Statistics shows that 57% of buyers wade through the process before even talking to a sales rep.
Technology has allowed ABM to scale. ABM takes a lot of resources and technology allows companies to easily and efficiently select accounts, go after them, and measure those accounts. Marketing and sales both have limited resources so targeting accounts basically leads to results and growth. Solution: Make sure marketing and sales are aligned throughout the entire process. Marketing and sales have to be aligned for ABM to successful. There has to be a way for marketing and sales to work together to prioritize which accounts to go after and work flawlessly together to execute the program. Solution: Don’t go straight to execution just yet. Oftentimes, companies go right to the execution piece of it rather than marketing and sales working together with the use of data to determine which are the highest priority and opportunity accounts, select those, and work hand in hand. Solution: Do the Art of the Start. Understand customer strengths and weaknesses. Align sales and marketing around target customers. Make sure you’ve got the right data analytics. Understand who your customers are and who your best customers are. Develop ideal profiles so you either go after incremental new customers or understand which ones you should be targeting to expand your programs with. Make sure you’ve got easy reporting in an analytics kind of way so marketing and sales can quantify what’s going on to the program. Analyze your account. Segment them and determine the best accounts. Replicate that and work in a collaborative method. Using data, understand the quantitative and qualitative input from sales. Data is the source of truth in both marketing and sales. It is therefore critical to have one source of truth so you can have one set of goals and one way to measure the funnel. This has to be done in every step along the way. ABM is about getting the right message to the right person at the right time. This message must be come from the combined effort of marketing and sales. Does ABM work in a small business? This matters more because small companies have less resources so the risks are greater. There is less flexibility so you can’t make mistakes. Therefore you have to plan it out correctly, do your work upfront, and you can’t go to the end and do the execution. The selection of companies is even more important.